This pickle post is especially for Judy! Pickles! What's not to love? Sour...crunchy...probiotic..."pre-digested super raw" veggies. Traditional...medicinal...and really good with a grass-fed beef burger! These pickling cucumbers came out of my backyard, I'm a first time pickle grower. Up until now, I've always bought them from whomever sells organic picklers at the City Market. (Did I use "whomever" correctly? I never know...) It's great fun for my kids (and myself) to check under the big, prickly leaves for pickles. Sometimes you miss one that's situated sideways and it grows into a giant...those always end up in my salad. Dill! Also from my backyard. A few plants volunteered, and I literally sprinkled the ground near them with seeds from last years dill thinking..."Hmmmf, we'll see!" What I saw was...every seed sprouting into a carpet of green. They would get about 6 inches tall and stop growing. So I started thinning and realized, why am I not dehydrating this?! The house smells wonderful when the dill is drying. Together at last...cukes and dill. I scrub the cucumbers with a previously unused toothbrush to remove the spines and dirt.. Then I decide. Chips? Spears? Whole? They all end up pretty much the same, but whole pickles take an extra day or so. I wash the bugs off the dill, I'm a strict no-pesticide type of gardener. If the bugs eat it, guess they were hungrier than I was! I like to do at least a quart sized wide-mouthed jar, but my favorite is the two quart Ball jar...or the gallon size if I have a great windfall of goods to ferment. Next, I add garlic that I peel and slice in half...the amount varies, 2 cloves will do for basic flavor...I've been known to add an entire bulb, especially a small locally grown bulb. Then...spices. This is where you can really personalize it. Sometimes I'll add a piece of cinnamon stick, or some sliced up jalapenos. For whole pickles, I stuff them down in the jar so they won't float when the water is added. Same with spears. For chips, I just pile them up in the jar. Next, make brine. The best brine solution for pickles is, as Sandor Katz describes in his book, "Art of Fermentation", 5%. Which is 1 quart of water with 3 Tbsp of salt. I use grey Celtic sea salt. You can heat this solution to make sure the salt is dissolved, then let it cool completely (too hot and it will kill the good bacteria) before pouring over cukes, or just let it sit. This also lets the chlorine have a chance to escape if you don't have a good filter. Where the "lacto" part comes in is...you can use whey to kick start the fermentation process. I strain whey off of kefir....curds and whey, little Miss Muffet??! That's the stuff. But it's not necessary as the pickles contain everything they need to ferment themselves. If I have fresh whey, I'll put a Tbsp in, but often I just put a little pickle juice from a previous batch in as a "starter". Even this is, unnecessary. The brine goes over the cukes, and you want at least an inch of brine over them. Chips are tricky because you want to keep your cukes below the surface of the water. Anything sticking up could mold, but it won't hurt you...hard to believe, but it's true. You should scoop it off with a plastic spoon (I never use metal utensils to work with fermented foods, especially anything silver...silver kills bacteria). I'll weight the cukes down by sticking a smaller glass jar on the cukes to weigh them down, then I put a coffee filter over the top and secure it with a rubber band so bugs can't get in. Or, you can just put a lid on it! Plastic lids are best. The waiting game begins. My pickles stay on the counter for about 3 days. If it's too hot, they'll ferment too quickly and get squishy, yuk. My kitchen is about 78-80 degrees most days, and I haven't had a bad batch yet.You'll see the pickles go from bright green, to a dull olive green...the water will cloud up, and little gas bubbles will escape when you move the jar. You can start tasting at any time...after a day, they'll still taste like cucumbers, after two days...half-sours...but three days...yum! When they're finished to your liking, store them in the refrigerator. They should last a few months at least, but who can keeps delicious pickles around THAT long? There are a lot of great resources online...just recently I stumbled upon Well Preserved. 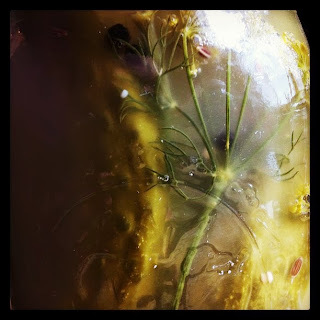 I learned how to make pickles from Sandor Katz's book the Art of Fermentation, and have expiramented with spices by looking at the bottom of a Bubbie's pickle jar, and from suggestions I've found online. Right now on my counter I have a batch of dills and a double batch of pickled jalapeno peppers. Who's going to taste THOSE to see if they're ready? !